Get your WEFF16 Tickets Now! Join us for this year’s West End Film Festival! 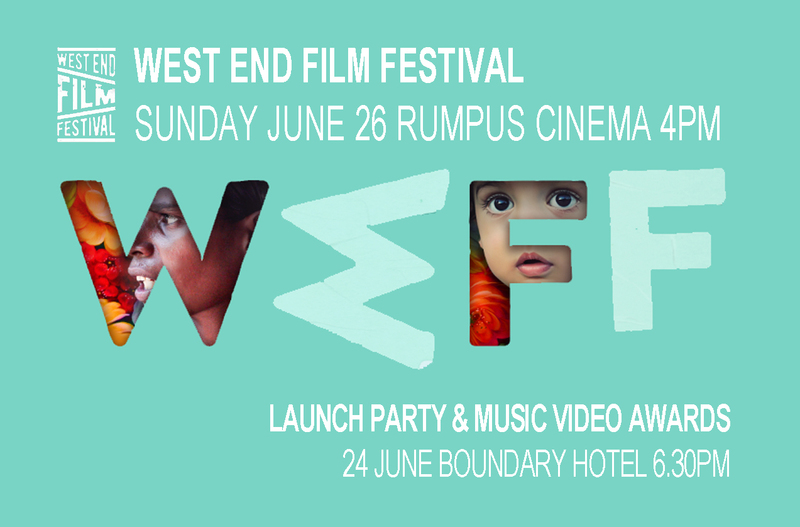 This year’s WEFF includes a Launch Party and Music Video Awards on 24 June (free tickets but we suggest you reserve a ticket now) and the main WEFF event on Sunday 26 June from 4pm at Rumpus Cinema. Tickets are $20 per session for Sunday’s event and are selling fast. For more details about this years program, go to our 2016 page where you can also buy tickets. Sign up to our newsletter for regular festival updates and program information. This year we’re working with FilmFest for all ticket sales. FilmFest promotes the rich tapestry of film festivals, special cinematic events and passionate discussion. It is the interface between multicultural and genre film festivals and festival audiences. Founded in 2014 by a group of film lovers including film festival directors, film academics with ticketing and rewards specialists, FilmFest is a collaborative online hub that brings together a broad range of Australian film festivals. It is an online platform for film festival audiences to enjoy richer experiences, explore and grow their love of film by effectively connecting the vast array of film festivals with like-minded film-goers.